Today is an American holiday fraught with controversy. In its honor, I have decided to reflect upon some indigenous languages of the Americas, one of which I know quite well and the other two of which I don’t. For those of you wondering what language was described in my book collection as a mixture of Polish, French and Chinese, wonder no more! Obviously this statement can only be qualified in regards to the way the language sounds, and even then there are those that may try to call it into question. 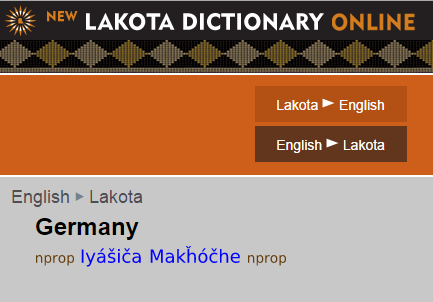 For one, the “l” sound in Lakota sounds very much like the English “w”, not unlike the Polish letter “ł”. One thing that is noteworthy about Lakota is that, unlike either of the other members on this list, it is a very purist language. For those of you who have studied Chinese you may remember that various country names are given new versions that match a certain sound in the language being borrowed from and a meaning in Chinese that is deemed relevant. There is a historical reason for this: American settlers were expected to speak English, and the Sioux picked up the language accordingly. As for the German-American settlers that spoke German and not English—they were known as the “people who speak badly” because they couldn’t be understood. The name stuck and remains in place until today. I actually did some searches in the Lakota Dictionary for “Israel”, “Austria”, and “Switzerland” and it didn’t turn up anything. The words for modern inventions are likewise all neologisms, not unlike the situation found in Icelandic, also noted for being notoriously purist. Some things you may recognize in the journey to learning (which I have barely begun because of sustaining other languages): the word “tipi” comes from Lakota, as does a system for giving names to outsiders, similar to that of Chinese (also quite purist). Obviously this system has been featured in American popular culture depictions of Native Americans. For those of you who might have played some of the Age of Empires games, I recall vaguely that one of the installments did feature Sioux soldiers using bits of genuine Lakota. Before I go onto the next language, I should say that the Lakota Language Consortium has created a version of the Bernstein Bears cartoons dubbed into the language! Greenlandic is an Eskimo-Aleut language with a good balance of purism and Danish import words. The word “Inuit” is actually a Greenlandic word, meaning “people”. For that matter, “Igloo” also comes from the word “illu”, meaning “house”. The names of the countries in Greenlandic almost all come from Danish, with exceptions made for Greenland, the United Kingdom, Denmark, and the Faroe Islands (arguably America, which could be referred to as “USA”, “Amerika”, or “Naalagaaffeqatigiit”, which is a literal translation of “United States”). Some linguistics have referred to Greenlandic as the world’s hardest language, and therefore I should consider a blogpost as to why learning Greenlandic isn’t as hard as they might thing. But this is not that post. Interesting fact: Greenlandic was featured in Gravity, spoken by an off-screen character singing a lullaby. One of my favorite television shows back before KNR did a cleanup of its site a few weeks ago was this show, “Pisuttuarpunga” (a kid’s show, “I was out for a walk”). It is based on the premise of a Greenlandic children’s song about what kids think about when the adults in their lives are away working. My journey through Greenlandic Language and Culture has been quite extensive so I invite you to look around this blog and read what you want on the topic, should you be interested. Nahuatl is probably the best known of the “Nahuan Languages”, which is why my book regularly offers dialectal varieties. Students of Nahuatl may be surprised with the amount of words that may be familiar to them in some context already—“Tomato”, “Avocado”, “Chili”, “Mexico” and “Chocolate” all have their origins in the language. Many place names of Mexico are similarly indebted, as are import words known to speakers of Mexican Spanish. …but it is good to know that there are many universities throughout the world that are teaching it and that there are eager students willing to learn! The second time at the NYC Polyglot Bar didn’t nearly have as many Yiddish speakers, with German- and Spanish-speakers dominating instead (although Yiddish did have a significant presence). I remember Ernest Hemingway having noted that in every port of the world there are at least two Estonians. No Estonians were present at this gathering, and I was the only Estonian-speaker present, but there were at least six other people who said that they knew/lived with/met with one Estonian (or more). Nor was I the only speaker of a Scandinavian Language present. There was a fellow Danish-speaker present as well. Fairly interesting: he found Swedish and Norwegian quite elusive (given as he didn’t study either of them), despite the fact that these languages are so similar. So similar, in fact, that I made a discovery this week that the singing voice of “The Little Mermaid” was done by the same person (Sissel Kyrkjebø, a Norwegian singer) in the Swedish, Norwegian, and Danish dubs. My command of Danish and German I felt was strong, I wasn’t grasping for words although I might have slipped up some grammar points (did that in English, too). Yiddish was slightly weaker but still good (despite one time in which I misheard something and answered a completely irrelevant question). My Spanish and Hebrew leave a lot to be desired. Specifically, I felt myself pausing too often and making grammatical mistakes more than I would in any of my comfortable languages. Confidence, too, was an issue. My ability to understand everything in all four of these languages was perfect, however. There were at most three words that I missed between the four as far as the conversations went. One nickname I got was “the guy with the Faroese book”. It made its appearance when people asked me how I learned the language. Obviously the book wasn’t the only thing. The Northern Sami phrasebook also seemed to be quite popular. Interestingly, nobody asked me to speak any of it. 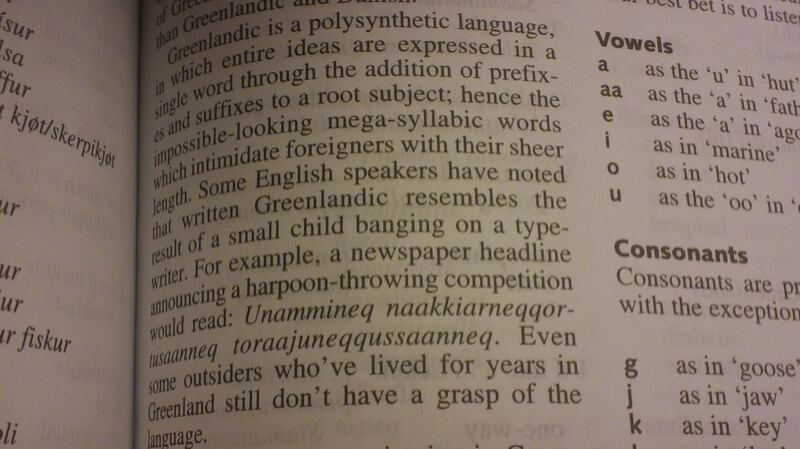 The one language I get most commonly asked to speak for people to hear is, obviously, Greenlandic. Apparently someone told me that spoken Dutch sounds like someone talking with a potato stuffed in his or her mouth. Any Scandinavian will definitely recognize this idea as having been applied one-too-many-times to refer to the Danish Language. Asked to say something about Danish, I recalled the not particularly politically correct observation of one of my German colleagues that “Danish sounds like vomiting”. Portuguese and Dutch were a lot better off than Spanish and Hebrew. I made significant progress with both ever since I got back to the United States. I’m at a point where if I don’t have enough media of both in my life, however, my knowledge of both will lapse significantly. I was told with both that my accent is really good (heard the same for Yiddish). I was asked what my favorite language is. I gave an answer in multiple capacities. That is a post for another time. Got asked my favorite language for cursing. This one I can give: Finnish. Without a doubt. I’m not going to teach you any Finnish bad words here. Send me a private message or, better yet, meet me at a polyglot event. But if you know me in person and spent any time around me, you’ll definitely recognize a few (unfortunately, I tend to use them quite frequently when agitated). Now here’s the biggest improvement: I wasn’t mixing up any German and Yiddish this time! Boom! But while German/Yiddish and Swedish/Norwegian are out of the picture, now I have a new culprit: Spanish and Portuguese. Who knew? There were some people who took my picture / interviewed me / asked me questions etc. Quite exciting! If anything comes of such things, they will make their way to this blog in due time. Make Spanish and Hebrew television a part of my life, and keep it that way until I feel that I get good with both. I did this with the Scandinavian Languages for the past year and I don’t regret it one bit. Now I have to do the same for the languages I learned in school. To a lesser extent, given as I have only recently gotten quite good with both Dutch and Portuguese, I need to cement their “entrance into the echelons” with media as well, and training myself to think in these languages in all situations. My skills in Russian, Polish and Northern Sami really, REALLY leave a lot of room for improvement. I’m not even close to conversational anymore, and a lot of this has to do with the fact that I’ve neglected them for other buddies. Plan 1: Ođđasat (the News in Northern Sami) every day. Plan 2: Bring back the Russian and Polish Music. Plan 3: Don’t skim the Russian and Polish posts on Facebook. Plan 4: don’t shy away form Slavic YouTubing. Plan 5: Don’t neglect my Nothern Sami Notes (from Gulahalan, etc). Now it comes for a time for me to really wonder: how many languages do I actually have time for? Do I have time for learning a new one? Can I actually maintain close to twenty languages and be ready to converse in them readily on a casual level? Will people even believe me? Will people doubt my resume? My local friends (and many others) tell me that I can definitely manage this, and already I seem to have skewed the odds in my favor by choosing languages in various family groups (Scandinavian / West Germanic / Finnic / Romance Languages). Here’s what I’ll do: I’ll know when it will be time to drop one of my language projects when I fall out in love with it. For now, however, I won’t stop my new acquisitions. And if the day comes in which I lose my attachment to one of my projects, then I will find no major problem with letting them go (I could relearn them whenever I want, and a “good head start” will certainly be useful should I choose that path).